7m/1300' from Hutton Roof Village Hall, near Kirkby Lonsdale (GR SD 570786). Hutton Roof comes of age. Runners of all abilities from across the country were invited to compete in a fell race celebrating its 24th year over the bank holiday weekend. 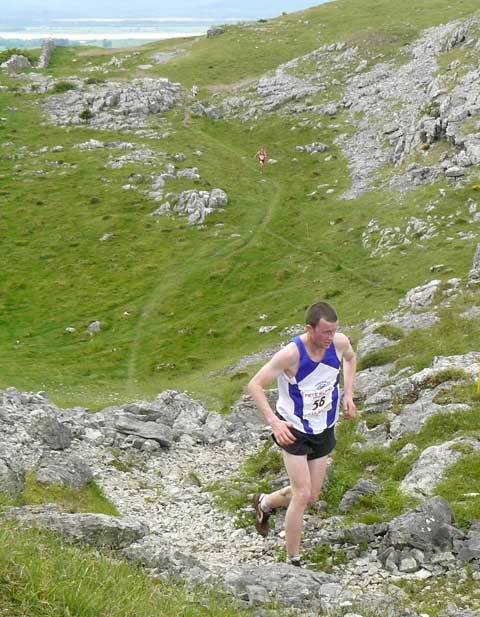 Hutton Roof fell race this year included the fell Running Association inter counties championship. 400 runners registered and it looked set to be a memorable race. The rain held off and although the ground was wet, conditions were generally good for running. After the hooter was sounded, a mass of approaching 400 runners motored round the first bend and out of the field. Spectators were struck by the sheer power of this field of runners as they sped across Hutton Roof Crag on route for Farleton Knott and our famous Scree slope climb. At the front, competition was fierce with a host of talented runners battling it out over the grass and limestone outcrops on the summit. Our Race marshal said the leading pack of runners swept passed him with last years winner Craig Roberts hanging on to something like 10th at that stage. The last section across Hutton Roof Crag is deceptive because it seems flat but the undulating course gradually climbs to the highest point on the circuit before crashing back down the hill to the finish. Somehow John Heneghan 45.50 of Yorkshire had taken more than a minute out of the field as he thundered down the track to the finish. Morgan Donnelly Cumbria was 2nd in 46.55 and young Matthew Gillespie Scotland West finished a great race in a time of 47.21. The inter counties team event was won by Greater Manchester. This was indeed a fast fell race, 22 runners completed the 7 mile course with 1300’ of climbing in under 50 minutes. Olivia Walwyn Cheshire 52.36 won the Ladies race from Katie Ingram Lancashire 54.20 and Anna Lupton Greater Manchester 54.36. The Ladies inter counties team event was won by Yorkshire. The club team prizes went to Bowland for the Men and Calder Valley fell runners for the Ladies. Forty athletes competed in the junior races each completing one or two short laps up and down the front of the crag. Mary O'Reilly Helm Hill 13.01 won the U12 Girls from Maddy Bell Dallam 14.54 and Scarlet Dale Hutton Roof 15.05. In the U14 girls Lauren Munro Bennet Helm Hill 23.21 beat Katie Buckley 23.36 and Alana Grundy 25.15 both of Bury AC. In the U16 Girls race Robin Goodfellow Dallam 25.47 beat Reanne Harvey Dallam 28.28. The U12 Boys race was won by Tom Taylor Kendal AC 11.02 who beat Davd Goad Helm Hill 11.13 and Ben Kent Helm Hill 11.59. Ryan Sciacca Chorley AC 22.24 won the U14 Boys from Nathan Milligan Bury AC 23.12 and Ben Heywood Bury AC 23.34. Elliot Wylie Rossendale 20.16 won the U16 Boys race from Luke Betts Chorley AC 20.36 and Alex Brown Unattached 26.19. The Cup for First Local went to Joe Schofield 14.51 in the U12 race. In the main Race from 365 entries we had 347 runners completing the course, more than a hundred up on last year. Many runners said they enjoyed racing this course as part of a big field and they all enjoyed our famous tea and cakes at the finish. One runner stopped transfixed in front of the cakes and said, “ It’s true, it really is the Manchester United of fell race teas!” Don’t miss next years ‘cake race’ on the 29th May 2010.